Remember when you were toting around your trusty Boy Scout Knife and thought you were ready for whatever the world threw at you? Those were the days, weren't they? Well, this isn't your old Scout knife -- this is the Scout knife you wish you'd had. 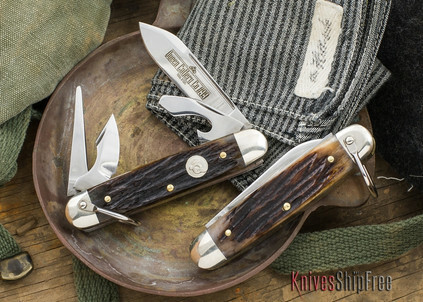 If one of your less-than-fond memories includes soft steel that didn't hold much of an edge, you'll be glad to know that this Scout is made of Queen Cutlery's incomparable D2 tool steel. This knife has it all -- nostalgia, sure, but quality and super edge-holding as well. The #99 Scout from Queen features a robust spear-point blade, a sturdy can opener, a leather punch and a cap lifter/screwdriver blade in corrosion-resistant, high-carbon D2 tool steel.